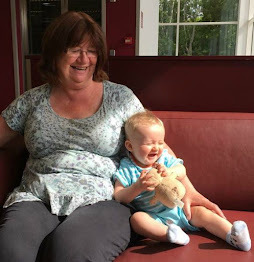 Looking for something to entertain your toddler? 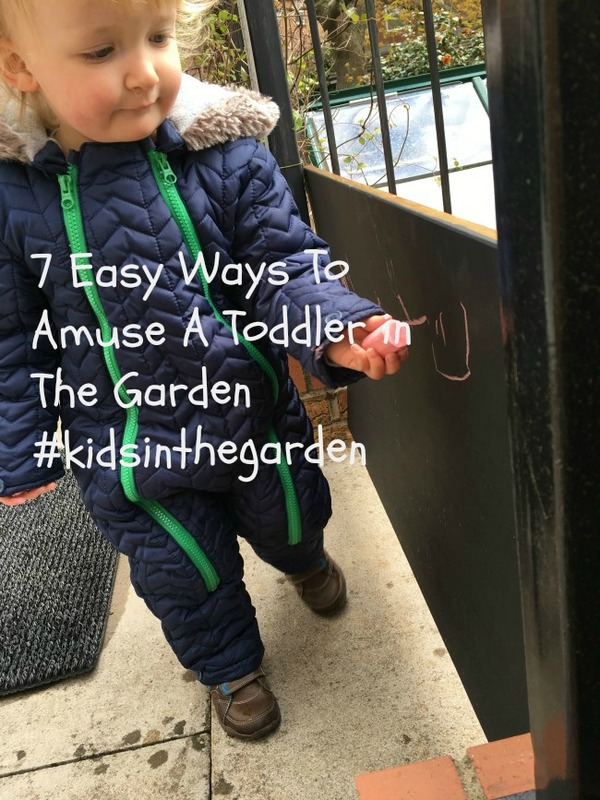 Here's 7 easy ways to amuse a toddler in the garden. They can be done even when the weather isn't perfect. 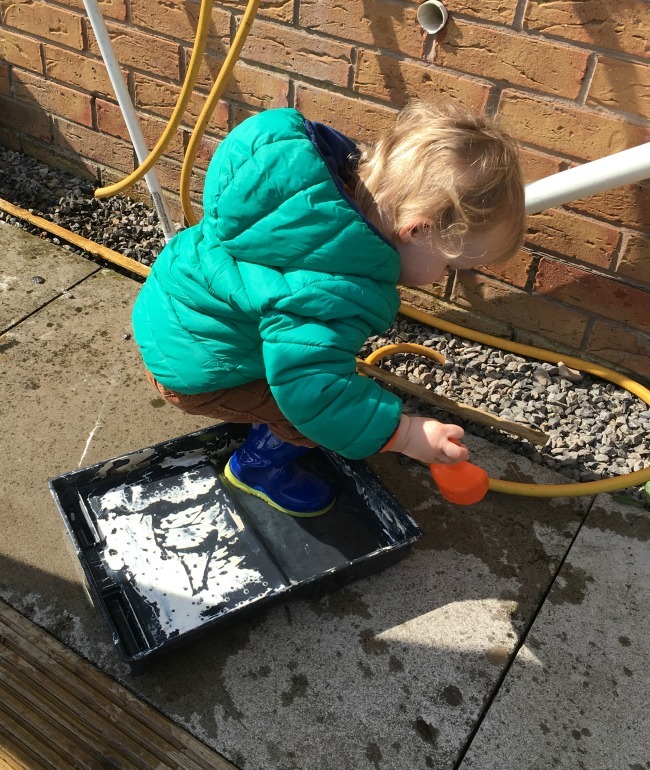 Toddlers love to be outdoors and when it's sunny and warm it's a doddle but what can you do regardless of the weather? 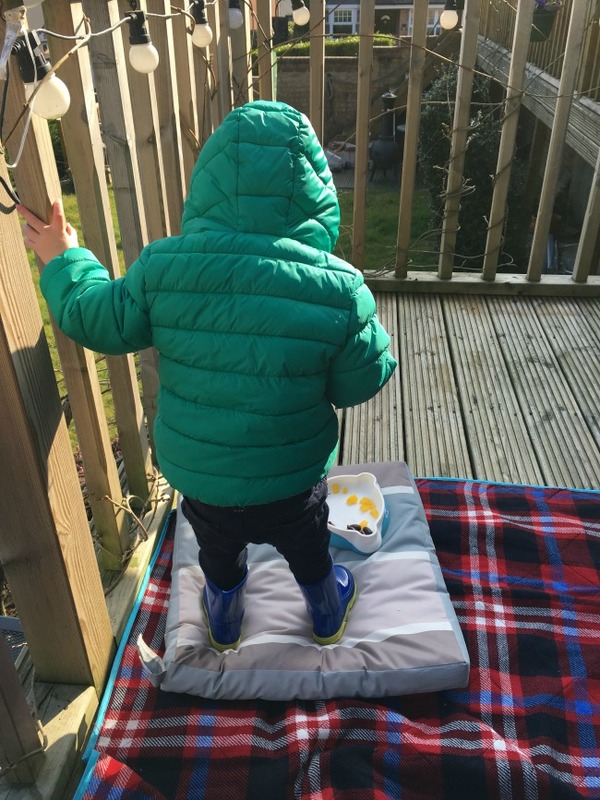 Here's a few tips that will enthral your toddler and may even give you a few minutes break. Anything with water in it. On a hot sunny day then of course the paddling pool but most days aren't hot and sunny. 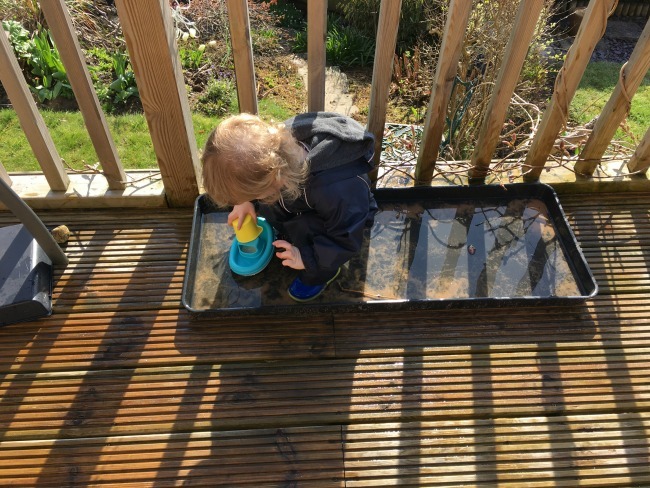 Just pop on the waterproofs and some wellies and give them an inch in a plant tray, or a paint tray or just a plastic pot. The only requirement is that it must be big enough for at least one foot to get in and splash, preferably big enough for both feet. Pavement chalk is a fabulous thing. 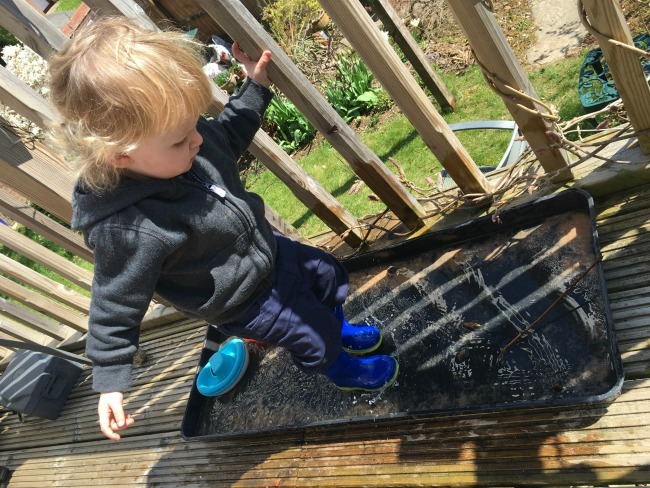 It's chunky so easy for small hands to hold and washes away in the rain. 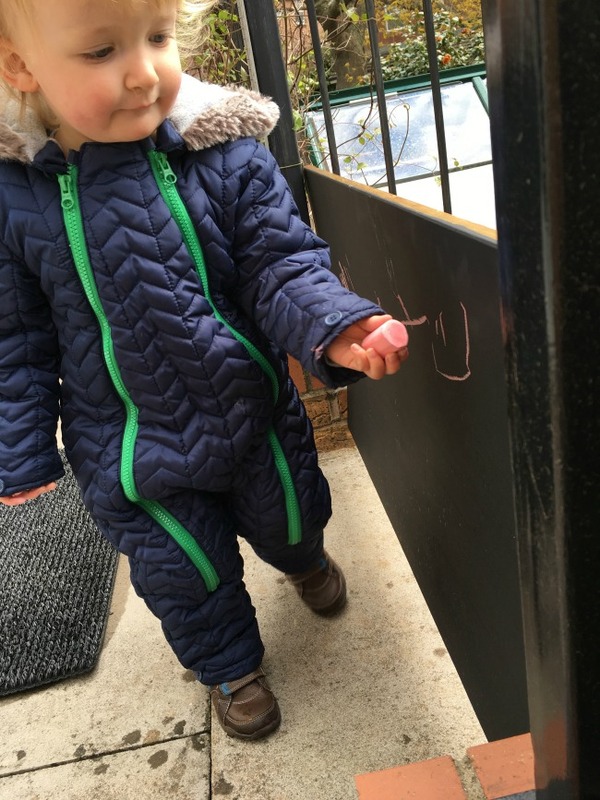 If you are handy with a bit of DIY then make a chalk board using blackboard paint. I first saw this on Family Days Tried and Tested facebook page. You can fix your board to a wall, we had a wooden barrier at the top of the steps which we painted with blackboard paint and is great. 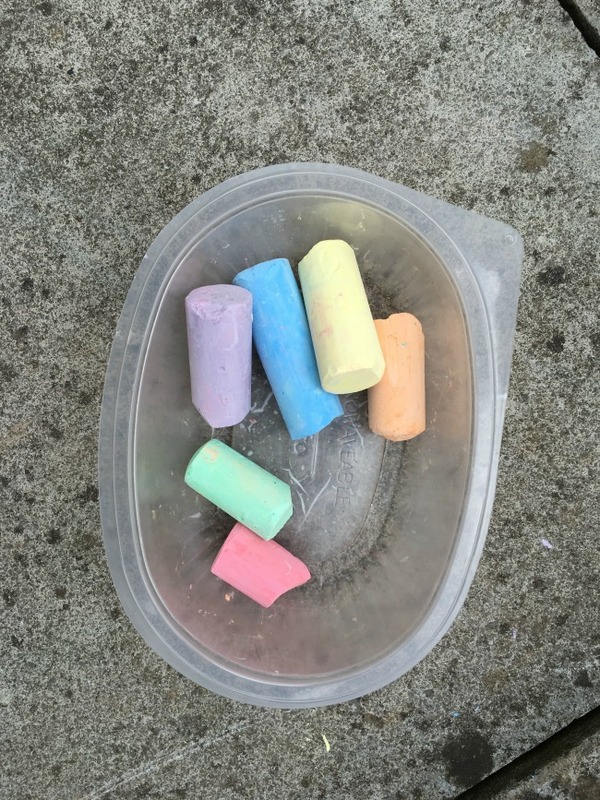 Keep the chalks in a plastic food tub near the board and then they are always where you need them. It really doesn't need to be much. 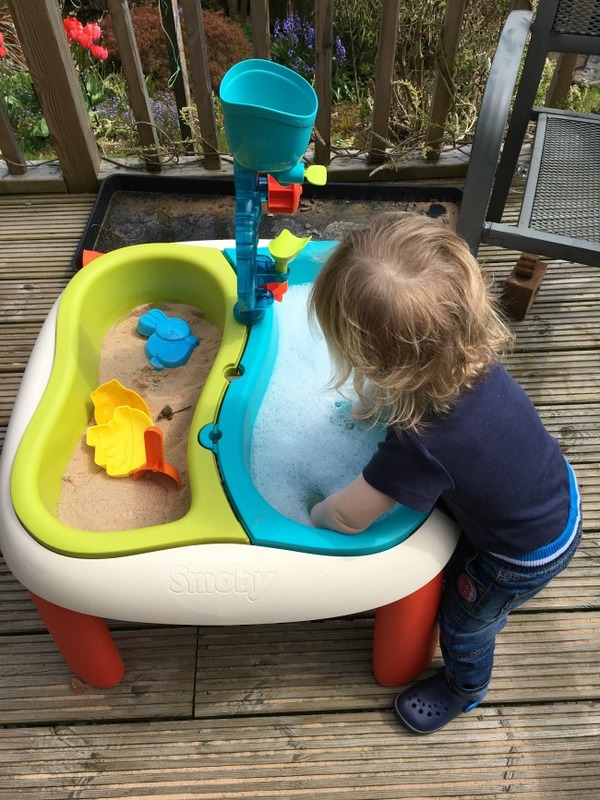 A great big sand pit may be necessary for bigger children but toddlers are happy with a potful. 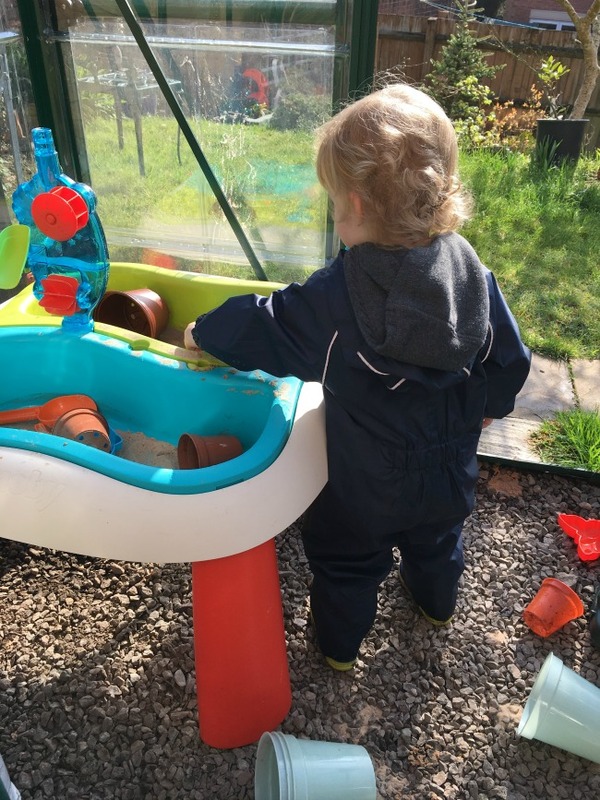 We've got a sand and water table but all that is needed is a pile in the corner with a flowerpot to cover when it's not in use (stops the cats using it!). OK this rock is much too big! 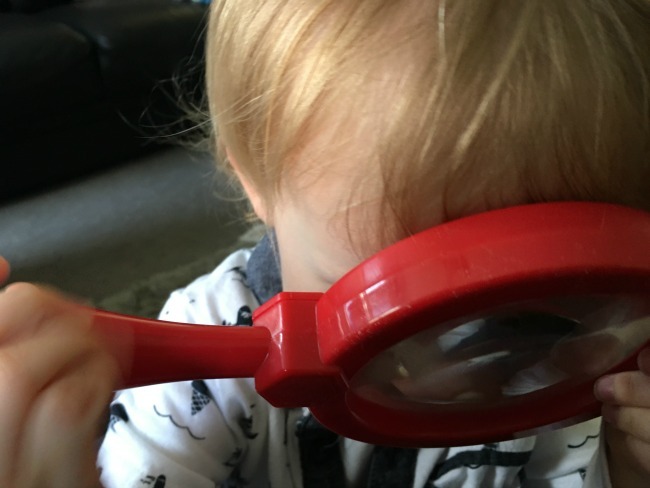 Even little ones can enjoy searching for bugs. 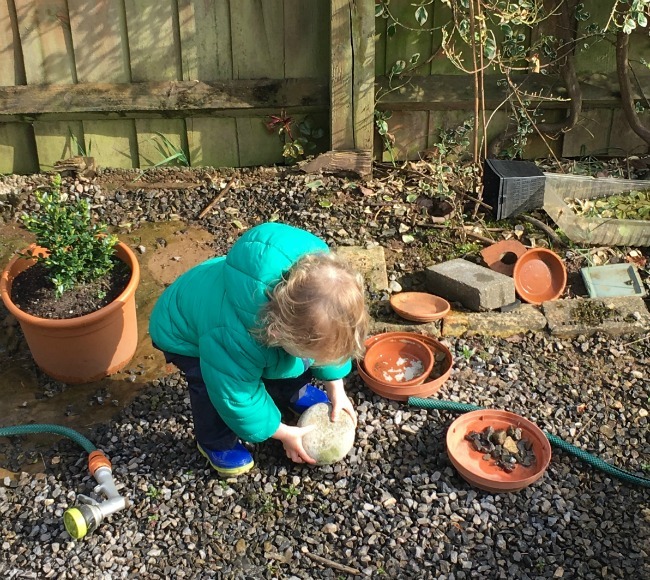 Bear is 19 months old and recognises lots of things in the garden. 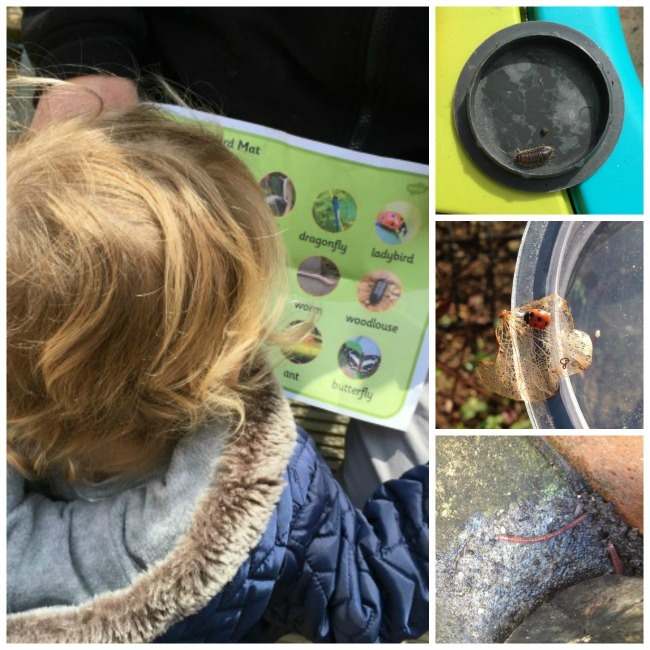 Worms, ladybirds, woodlice, butterflies, slugs (ugh! ), ants and so on. It's good to have a printed sheet with pictures on and there are lots of free printables. 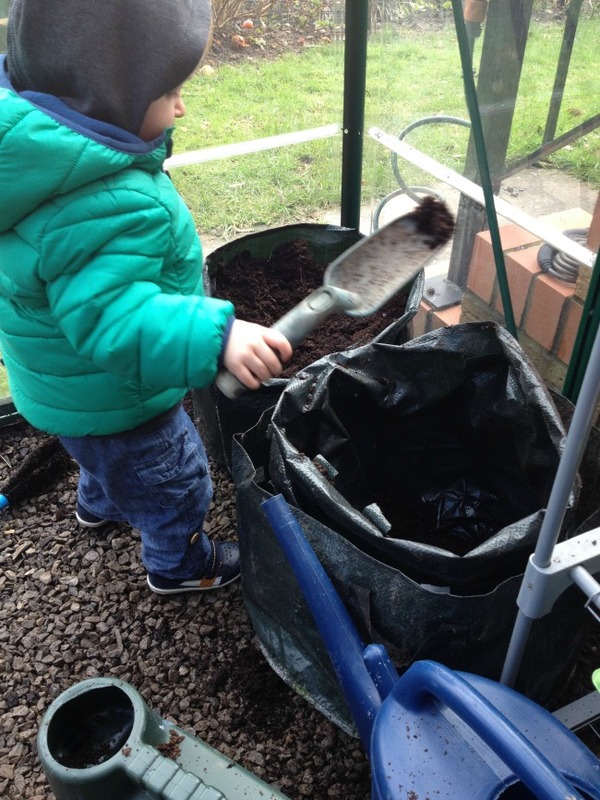 Toddlers just love to help and especially like doing grown up things. 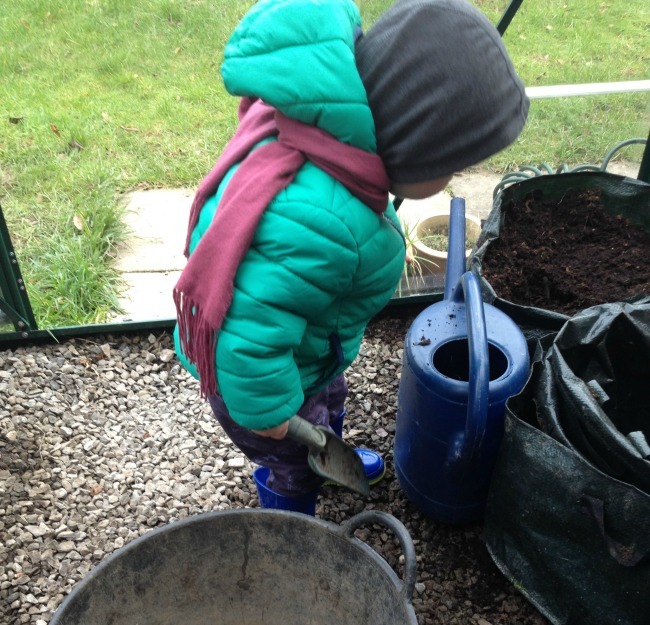 Sow some seeds, pick up leaves, sort the gravel or stones into pots, sift the compost. Feeling adventurous? Then let them water the plants. Everyone loves bubbles! 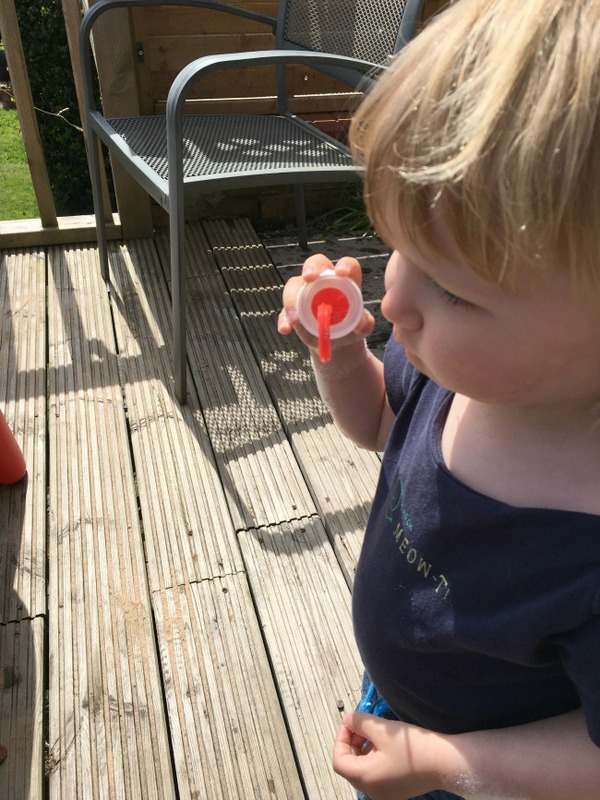 Put some baby shampoo in the water and let them play with the bubbles. We use Burts Bee's as it has no nasties in it and doesn't sting their eyes. Don't forget its not the weather its the clothes! 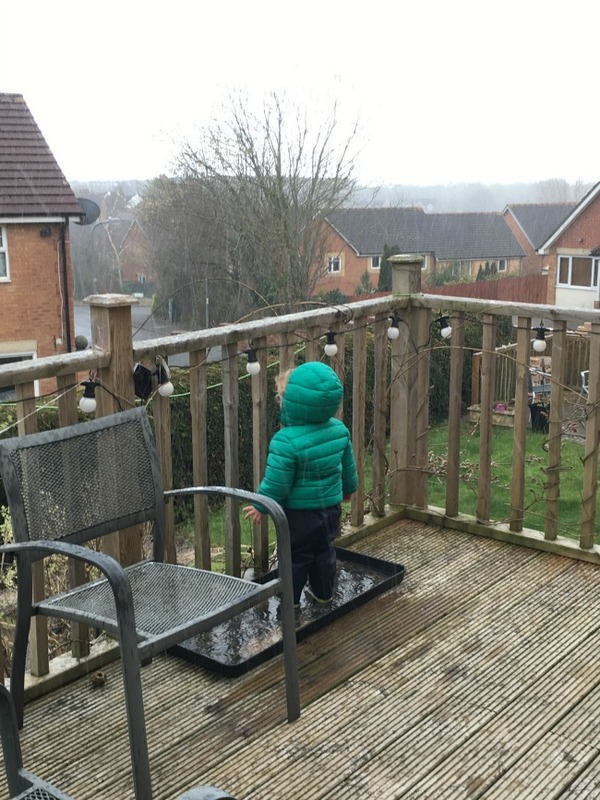 Bear enjoying the winter rain. 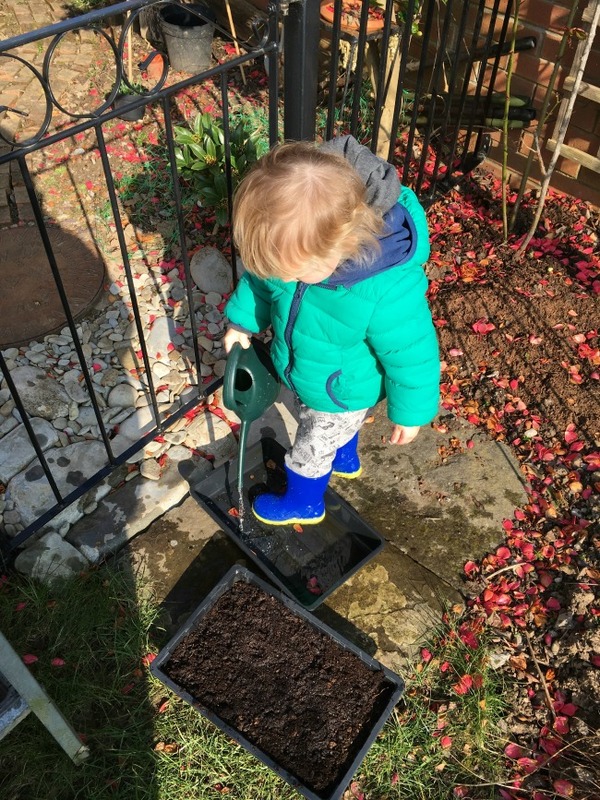 Wellies, muddy suit and coat. Snug as a bug in a rug. There are lots more things that you can do, make a tent, put the ball pit outside, I'm sure you can think of loads too. Have a lovely time outside and any suggestions please let me know in the comments. 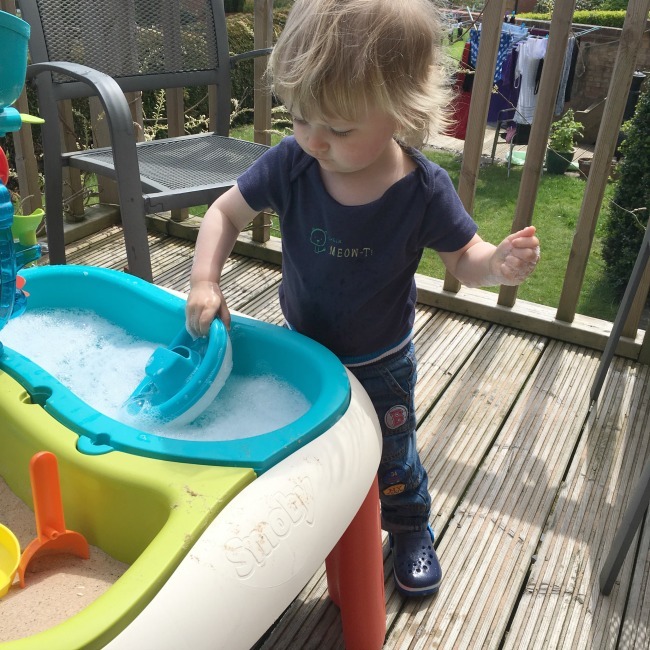 Water, bubbles and chalk are all huge favourites here, and everyone loves a picnic too! 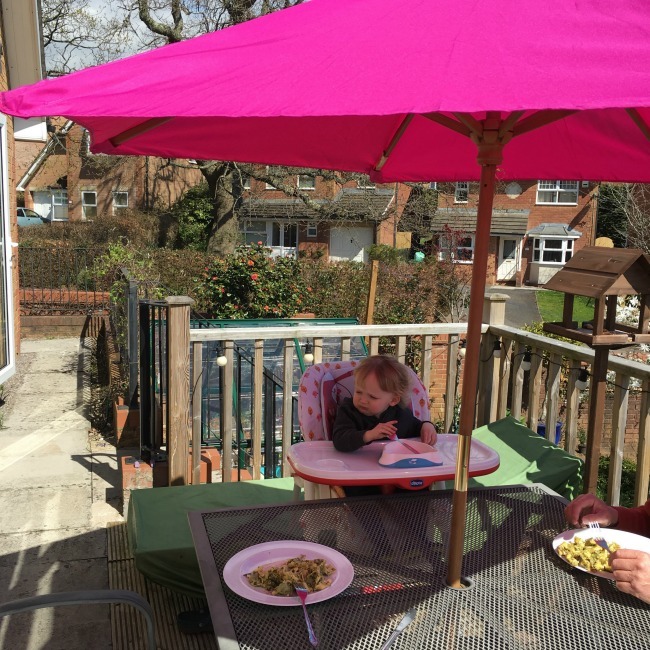 Great post, especially with the lovely weather we have been having! Some brilliant ideas here! Been wanting to get some chalk for my son for ages now and this has made me buy some from Ebay! I'm always trying to get out every day (when its not raining) and these are some ideas to add to my list of things to do! 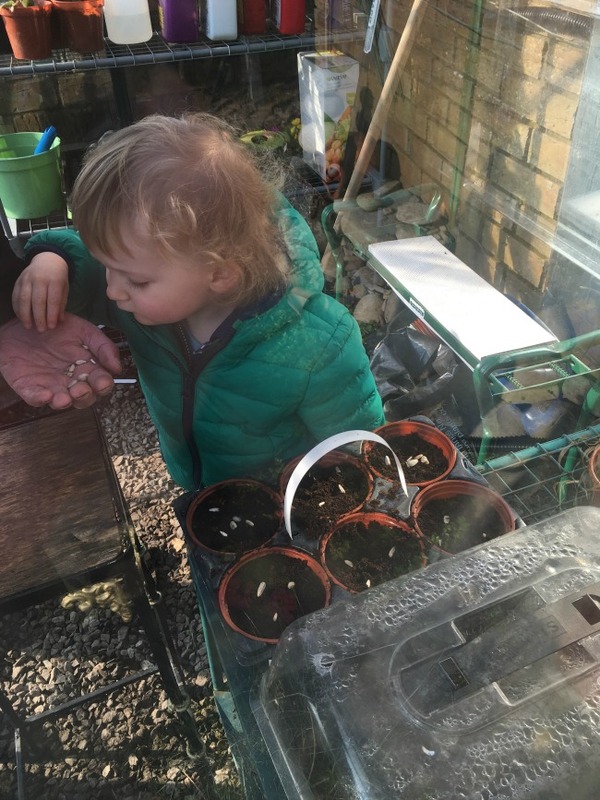 Fabulous ideas for #kidsinthegarden , I love all the pics but my fav is the bugs one . Nice close up shot of ladybug .